Overall I like this audio method of learning and reviewing Spanish. It gives me a more better edge of utilizing the Spanish I've learned throughout my time in college and high school while effortlessly picking up much more vocabulary in a much quicker pace. In college I've completed two levels of intermediate Spnanish and even took Spanish composition, but I had trouble with applying my learned boring grammer skills in a spontaneous conversational fashion. 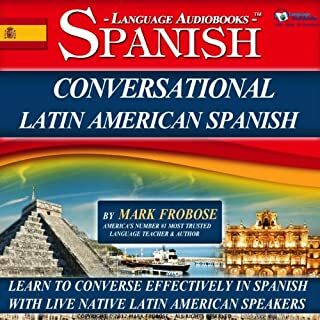 This conversational Spanish audio book enables myself to learn with less effort and boredom practical conversational skills. However a visual video with this audio method would add more as well as more chapters that are jiust as practical as the current chapters to help increase and advance basic and intermediate skills.